Drew Lang spends most of his time as a classical percussionist playing with the Dallas Opera Orchestra, Fort Worth Symphony, Dallas Wind Symphony and many local regional orchestras. Internationally known as a marimba soloist, he has premiered and recorded concertos with orchestras and wind ensembles. His latest venture is a consortium with twelve university percussion ensembles from across the country. Although classical percussion and marimba has been his legacy in the professional music scene, drum set has been his passion since his parents bought him a pair of drum sticks and he wore out 4 Montgomery Wards and Sears Christmas catalogues. As a kid in Monahans, Texas, he played in a few garage bands (rock and country) then eventually started playing in jazz trios and dance bands in college. After graduation, he played in the country/jazz scenes in Tucson Arizona, Oxford Mississippi, and Nacogdoches Texas. 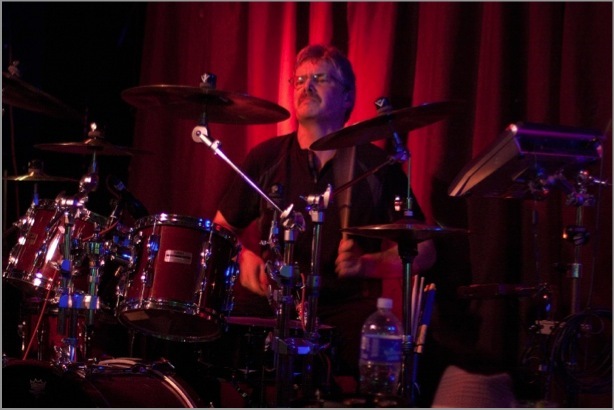 Drew’s drumming influences in grade school mainly revolved around Neil Peart and Buddy Rich. His technique was further refined while playing snare drum with the 27th Lancers Drum and Bugle Corp (Revere, Mass). Drew had not put stick to skin in the name of rock since playing for his senior prom with the rock group “Blue Max” (although he did play a few shows with the Fifth Dimension in Tucson when their drummer became ill . . ..). He joined Norm and Eric in 2007 and has thoroughly enjoyed reliving “the dream.” He also finds it some what ironic that when he was younger he was mostly playing jazz and dance band music while most of his peers were playing rock – now he’s playing rock while most of his peers are playing jazz and dance band music. His current setup with Scarlet Vermillion includes a Pearl Reference or a vintage Yamaha Recording Custom drum kit, although you may never know what he has up his sleeve. Electronics include a Roland SPD-SX Sampler/Trigger and a Roland KC-550 amp. Drew is on the percussion faculty at Southern Methodist University and is the percussion/drum set instructor at Eastfield College. In the summer, he is principal percussionist for the Breckenridge Music Festival in Breckenridge, Colorado.